Although on the face of it, LED lights appear costly, they are still extremely popular because they are not only strong, lasting as much as 22 years, but also excellent energy savers, converting 80% of energy into light. As against this, usual luminous bulbs have very short life and also consume a lot of power. That is why electricians strongly suggest LED lights. What is LED? LED is an abbreviation for light emitting diode. They are encapsulated in tiny plastic bulbs that are just about one to two mm. As opposed to standard incandescent bulbs, LEDs do not have filament that can burn and emit light. They emit light when electricity passes through them releasing photons in an external direction. Although LED light was red in color when it was first introduced, it is now available in extensive range of colors covering the entire color spectrum. These unique features make LED light most suitable for a large number of applications. The history of LED can be traced to the year 1907 when the British scientist H.J. Round discovered ‘electroluminescence’ as a phenomenon. His discovery was followed by Oleg Vladimirovich Losev creating the first LED in 1927. However, it was several decades later that the first red. LED was produced at General Electric Company by Nick Holonyak Jr. in 1962. In view of his outstanding contribution, Holonyak is, at times, called the ‘father of the LED’. However, the technology that was adopted at that time in making LEDs was prohibitively expensive making it unfeasible to produce on a large scale. It was only in 1970 that LEDs came into prominence. Even though LEDs are more expensive than the standard light bulbs, people still prefer to change over to them because of their energy saving potential. LEDs not only emit more light per watt than a normal incandescent bulb, but also convert 80% of energy into light. On the other hand, an ordinary incandescent bulb converts into light at only 20% efficiency. Besides lower energy consumption, it has a longer life with over 100,000 hours depending upon the heat and light factors and is more robust than a normal incandescent bulb. This means that a LED light bulb lasts an unbelievable 22 years. As compared to ordinary bulbs, LEDs are more robust and dependable. The plastic housing makes LEDs better shock resistance products. 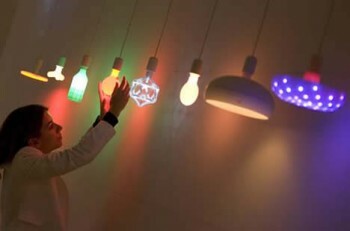 As they can emit colored lights without any filters, LEDs can also be turned into diffused lights whenever required, besides generating a little heat. Surprisingly, the emission efficiency of LEDs increases in colder temperatures. As LED lights can be switched on or off quickly, they are ideally suited for use when cycling. Earlier, LED lights were used as indicator lights for appliances. However, with the increase in energy efficiency and reduced costs, LEDs are now being used almost everywhere from aviation, automobiles to traffic signals. LEDs being small in size are widely used in circuit boards. As they do not generate excessive heat they are also employed in making ‘heat sensitive’ products. The LED has made rapid strides since its introduction in 1927. Even though relatively more expensive than the standard lighting, its energy saving potential and other strengths of the LED light make them a favorite product of many individuals, electricians and industries. They find variety of applications in televisions, computers or even in airplanes.